I'll start by saying this is not a perfect show, but then how many shows are today? I will say it caught my interest initially with the casting of Bill Paxton for it's lead. I didn't jump on the show when it first aired otherwise it would've been a bit more nerve-whacking to have to follow week-to-week. However, I'm glad I finally was able to marathon the first half season. Keep in mind, crime shows are so not my thing. The last somewhat crime show I watched was "The Following", and that was similar for the casting of Kevin Bacon in that show's lead character. I will say that show was far better than the "Training Day" series, but then who doesn't like a serial killer in TV. However, like all shows had its flaws. I love "The Walking Dead", "Orphan Black", "Bates Motel", and "American Horror Story" for just some of my favorite shows. What do those shows have in common with "Training Day"? Nothing, except that they all have their flaws. Minor flaws in comparison to this show, but flaws. I agree with some of the criticism with "Training Day", that the plot is usually a bit muddled or rushed. The chemistry with most of the cast just isn't there at times, maybe even half of the time. Other than the character of Frank Rourke, I'm really not too interested in the other characters. However, the show is still watchable because of Bill Paxton. His role and his acting ability just brings life to everything somehow, someway. I honestly don't think anybody else would have had that star power for this show's lead role. And I really don't understand anyone just flat out hating this show. True, the show could've been closer to a 8 to 9 star show. 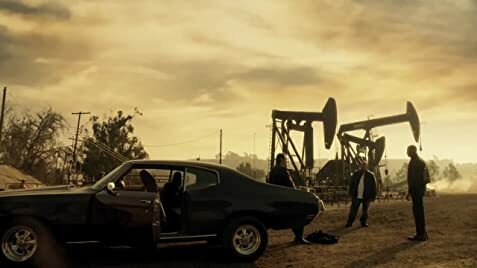 I would have liked to have seen the more gritty look of L.A. that the movie showed, and I could have seen a much more better story-line than what the show currently is running with. But the show is still fun. Most cliché one-liners are boring or are said without hitting the right note, but then there's Bill Paxton. The guy is talented on delivery alone. I would give the show 6 stars, but Bill Paxton earns my seventh star. As for the show now with the passing of Bill Paxton. I don't think it has much of a chance if any to go on. It was his baby in a sense. He will be missed for a very long time like most are. I seriously don't understand how this show is only rated 5.5 stars. When every individual episode has no rating less than 6.7 stars. Maybe the bad reviewers take the time to rate the show down, and write a bad review, but not rate every individual episode? You want to watch a bad show, go watch reality TV or a game show. Watch Teen Mom 3, or The Wall, because "Training Day" is a good show. Originally the pilot script had the corrupt older cop as Jake Hoyt, the character Ethan Hawke played in the movie. The show moved away from that version when Hawke declined to be involved.